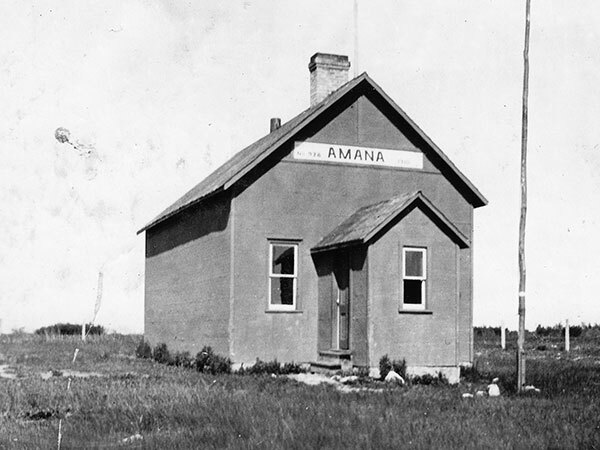 The Amana School District was organized formally in January 1898 and a one-room schoolhouse operated at NW12-15-10W in the Rural Municipality of Lakeview. The district was dissolved in 1967 and its catchment area became part of the Langruth Consolidated School District and later the Pine Creek School Division. Among the teachers of Amana School were N. M. Campbell (1907), M. J. Moffatt (1931-1932), Alma Hazel Smith (1933-1935), Olive Cameron (1935-1936), F. Ross Kinley (1936-1937), Albert Carnelley Brook (1938-1939), Marshall William Joyce (1939-1940), Agnes Lillias Stewart (1940-1942), Victoria A. Bobick? (1942-1943), Esther Dorothy Baissie (1943-1944), Sam Sigurdson (1944), H. Russell Moffatt (1944-1945, 1951, 1956), Gwendolyn May Young (1945), Laura Mildred Karlenzig (1945-1946), Edward Clarence Malazdrewicz (1946-1947), Tena Rempel (1947-1948), Nellie Lucille Keast (1948-1950), W. Podruski (1950), Frederick Charles Larwood (1951-1952), Lena Thorleefson? (1952-1953), Sheila Wenonah Moffat (1953-1954), Grace H. Black (1954-1955), Alice T. Puddicombe (1955-1956), and Betty Oliver (1956-1960). School District Formation Files [Amana School District No. 928], GR1688, E0027, Archives of Manitoba. Departmentally appointed school trustee files (E 0034), GR1629, Amana School District No. 928 Daily Registers, Archives of Manitoba. Departmentally appointed school trustee files (E 0034), GR1629, Amana School District No. 928 Cash Book, Archives of Manitoba.